Today, on the ANZAC Day Centenary, we remember the efforts of not only the men but also the women who toiled alongside the soldiers during wartime. 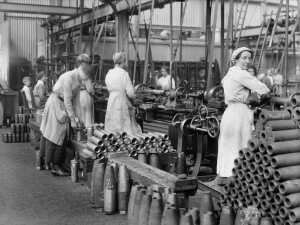 Whether these women were nurses at the front or stayed at home to literally “keep the home fires burning”, their role was just as important as those of the men they supported. 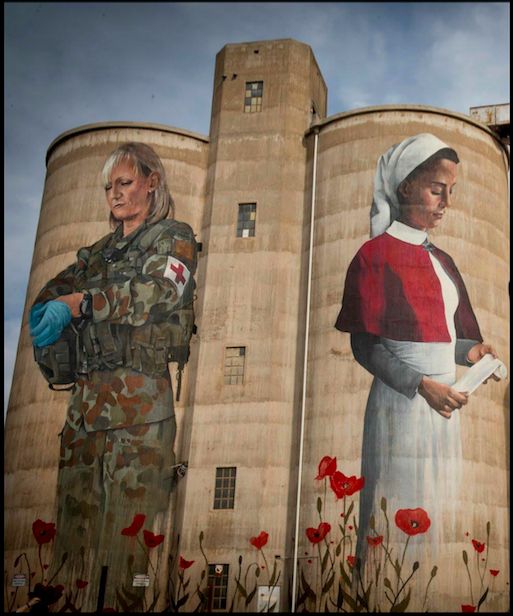 This war mural (in colour) on the GrainCorp Silo painted by Melbourne artist Cam Scale, illustrates two women who, although separated by a century, remain inextricably linked by their role in the protection of our country. This entry was posted in Anzac Day, General and tagged Anzac Centenary, Anzac Day, Anzac Day 2018, Women at War on 25 April, 2018 by belinda. 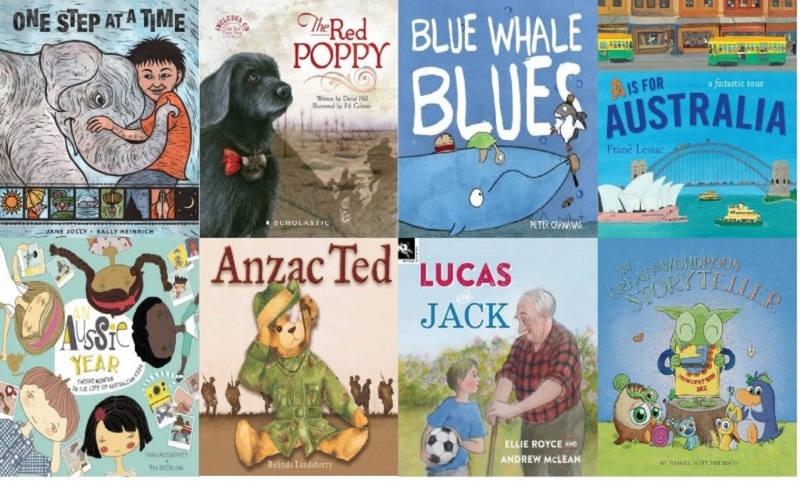 I’m thrilled beyond measure that Anzac Ted has been honoured with inclusion in the very special children’s war book exhibition, Anzac Stories: Behind the Pages! The exhibition kicked off in Brisbane in February and is the brain-child of renowned New Zealand author, Maria Gill and will be displayed in libraries around Australia for the duration of 2017 and 2018. 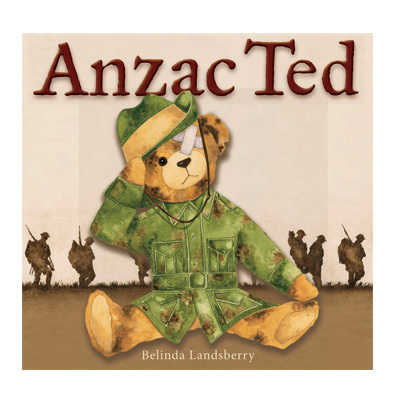 One of only 25 books to be featured from renowned Australian and New Zealand children’s book authors, Anzac Ted is certainly keeping hallowed company! 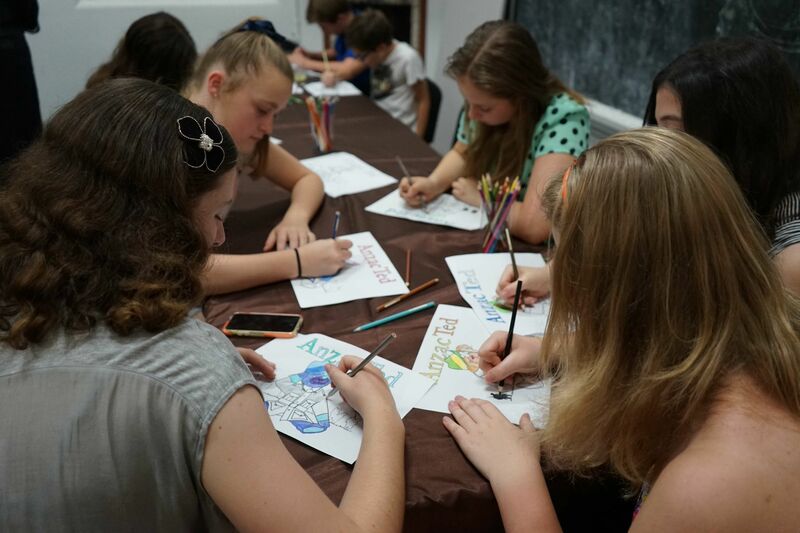 The exhibition covers some fabulous “behind the scenes” material regarding the research behind and making of a children’s war book. Including everything from pictures of original story boards to interviews with original ANZACS, if you only see one exhibition this year see this one! Incredibly moving and highly educational, this is something for the whole family including grandma and grandpa, so make sure you bring them along. 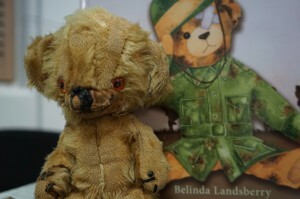 Look out for Anzac Stories: Behind the Pages Exhibition – and of course Anzac Ted – coming to a library near you! 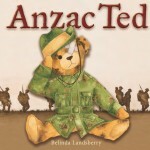 And don’t forget, Anzac Ted can be found at www.anzacted.com. 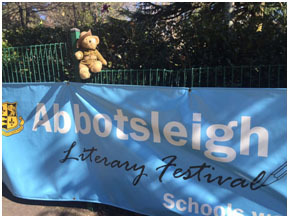 Ted debuting at the 2016 Abbotsleigh Literary Festival! As promised, here’s my recap for 2016! And wow! What an incredible year it was, too! February kicked off the year with Anzac Ted nominated for the prestigious 2016 Western Australian Young Readers’ Book Award. By April Anzac Ted had also been released in paperback in Australia and New Zealand! After six months of research, June saw me start a new writing adventure into YA Fiction. I’d wanted to write this story for years and finally sat down to do it! Needless to say I love, love, love writing it and am looking forward to getting it “out there” in the near future. Gorgeous student artwork during Book Week! August and September morphed from Book Week into Book Month as Anzac Ted and I took to the road and visited lots of schools and met lots of wonderful children, teachers and parents who all love books! Love this portrait of Ted! September came with the brilliant news that Anzac Ted had hit the “best seller” list. Ted and I were also asked to appear as guest speakers for EK Books at the 2016 SCBWI Australia and New Zealand Conference at the Menzies in Sydney. 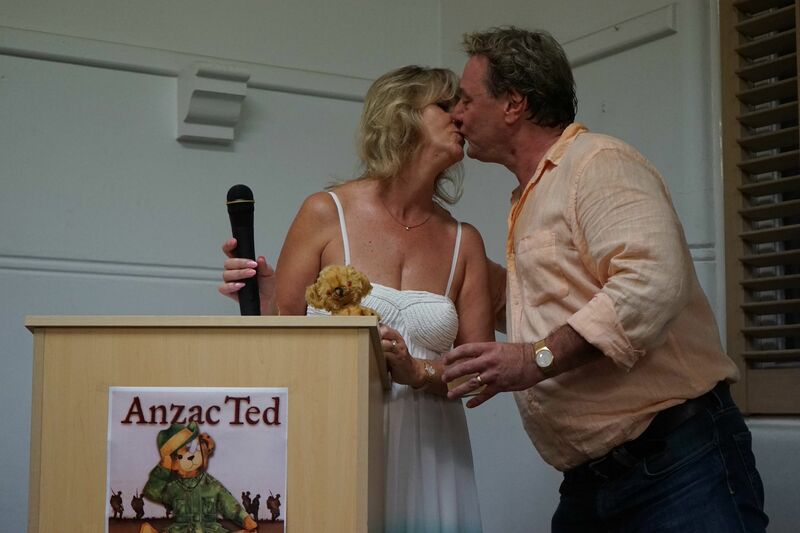 Suffice to say, while I “stole” the microphone in the room my original Anzac Ted teddy bear stole the hearts! Again in September (it was a BIG month!) 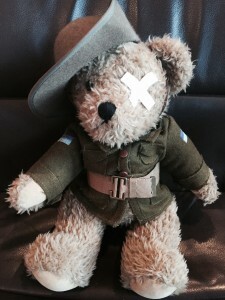 I was asked by the fabulous NZ author, Maria Gill, if I’d like Anzac Ted to take part in the 2017 Anzac Stories: Behind the Pages exhibition. Would I? Heck yes! This incredible exhibition kicks off in Brisbane in early 2017 so look out for it coming to a library near you! On the centenary of the first Anzac landing at Gallipoli, I felt I just needed to say something about this once-in-a-lifetime event and what it means to me. As the author and illustrator of Anzac Ted, I have had both the privilege and honour to be invited to numerous schools and preschools in the lead up to 25 April and speak to hundreds of children and teachers about my book. And it has been an incredibly moving and eye-opening experience for me. I have sat beside Australian war veterans bearing a weighty array of service medals on their breast pockets. 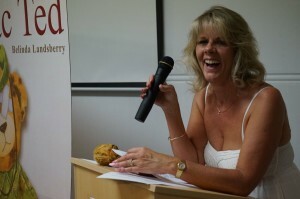 I have had hundreds of children listen to me speak and then ask countless questions prompted by my book. I have watched in breathless silence as wreaths were laid, songs from a world long past were sung and tales of our first Anzacs were told. But over and above all, I have been struck by the depth of respect, pride and awe – both here and overseas – which has been woven into the very fabric of our lives for those who have gone before and sacrificed so much. And this is not restricted to our soldiers but to their families as well who – in many respects – may have suffered just as much as their fathers, husbands, brothers and sons have. After all, they were left behind, not knowing the fate of their loved ones and yet they found the courage and strength to roll up their sleeves, lift up their chins and keep the home fires burning. As an Australian who has inherited the legacy of the sacrifice of these men and women, both past and present, I am truly grateful. I have always considered myself lucky to live in The Lucky Country, but only now am I beginning to understand what that really means. The 100 Anzac Commemoration has inspired a deeply moving and patriotic Australian spirit which has surpassed anything I have ever witnessed. People have come together, bound by gratitude and respect for our troops and their families. 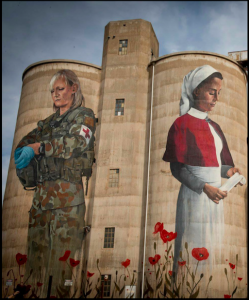 And while every Anzac Day is special, perhaps this one is more so because it has kindled the knowledge that not only are we tied indelibly to each other through our own unique history – but that we are seeing history in the making. So, long may the Anzac legacy continue to strengthen us as a united and grateful nation. Long may we acknowledge the terrible costs of war and of defending our hard fought democracy. Long may we continue to pursue peace and in so doing, acknowledge those men and women who are prepared to defend that pursuit on our behalf. 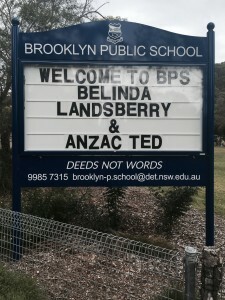 This entry was posted in Anzac Ted, Books and tagged ANZAC, Anzac Ted, commemoration, Gallipoli, war on 2 September, 2015 by belinda. 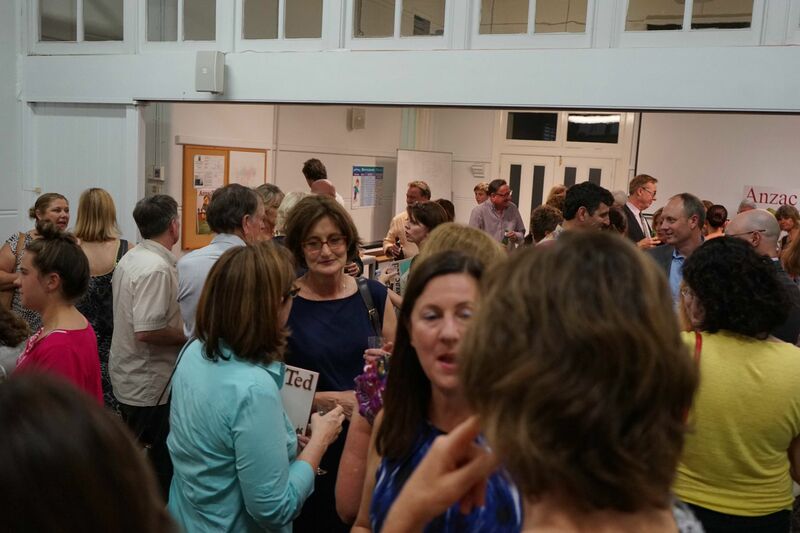 Friday 14 November saw the mercury hit a sweltering 38 degrees in Sydney – but the heat didn’t deter the sensational crowd from attending my first ever book launch for my first published book – Anzac Ted. 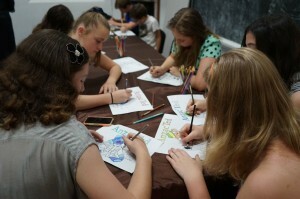 The bubbles flowed, the kids took industriously to the colouring-in table and everyone was in a party mood. 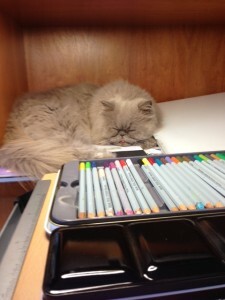 As I said in my short, and almost dry-eyed speech: writing and illustrating picture books may be a lonely pursuit – but it’s anything but a solo one. There are just so many people involved with getting Anzac Ted up and running and I couldn’t be more grateful to each and every one of them. To my parents for helping me fall in love with words so early on in life, and to my brother, Adrian for nurturing that love. To Anouska, Gareth and the entire team at EK Books (Exisle Publishing) for taking on an unknown author and to Ali and Mark for managing such incredible publicity for the book. 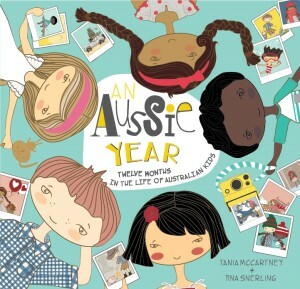 To the wonderful and talented Tania, Susan and the Kids’ Book Review team for their exceptional encouragement and support. To my biggest supporter and inspiration my husband, David, who not just encouraged and believed in me every step of the way but helped me organise every last detail for a successful book launch. To my gorgeous daughters, Samantha and Elyse for their unswerving faith, social-media know-how and terrific pics. To my wonderful sons, Michael and Alexander, who move not just mountains for me but are my tech-savvy saviours and of course to the ever-vigilant Alana and Karen who never fail to roll up their sleeves and make everything run like clockwork. Being also my mum’s birthday, there was a rousing chorus of Happy Birthday before I signed books for the rest of the night, and watched in awe and wonder as people approached me at the signing table with 3, 5 and in one case 9 copies in hand! The entire night was a very moving experience for me which was punctuated by so many highlights – but perhaps the most touching was when I was given a hand-written letter from a young Army wife, who had written to me about just how much Anzac Ted meant to her after she’d been given her own Army bear by her husband when he’d been shipped off for training. I was incredibly moved that my book had already made such a positive impact – and immeasurably grateful. Visit my Facebook page or the Anzac Ted website for more. This entry was posted in Uncategorized on 23 November, 2014 by belinda. At the eleventh hour of the eleventh day of the eleventh month in the year 1918, the guns fell silent. And the First World War; the Great War; the reputed War to End All Wars was finally over. Looking back as I am now from the threshold of the next century, I can’t begin to imagine the joy, the relief and the overwhelming gratitude the world must have felt at that moment; yet mingled with indescribable and inconsolable loss. Why the Great War started and how it ended is for all of us to debate. What we learned from it and how we put that knowledge into practice to ensure a peaceful future is up to each of us to decide. So as we stand and observe a minute’s silence on Remembrance Day, we remember those who served and who are still serving in all wars and conflicts. I have vivid memories of Remembrance Day when I was a schoolkid in the 60s. We knew it was a special day because we were all given a sprig of rosemary to wear in our button holes with reverence and pride. It was a special day because the teachers informed us we were required to stand still with bowed heads at 11 o’clock precisely and think about all the soldiers who had gone to war for us. Not so special was having several teachers punctuate the seriousness of this request with dark looks and threats of picking up papers at lunchtime should we waver in our reverence and pride by fidgeting, chatting to our neighbour or eating playlunch early. Suffice to say, most of the boys in my class ended up picking up papers at lunchtime! And that’s where it all ended. Ironically, for the kids at my school, Remembrance Day often lasted about as long as the wilting rosemary in our buttonholes. Then it was promptly forgotten. Still, we had little to draw from. Many of our fathers and grandfathers had served in the World Wars, and yet I know that in my house the subject was never broached. War was considered a closed book – especially for children. And it’s a tricky topic – how much should children be exposed to? 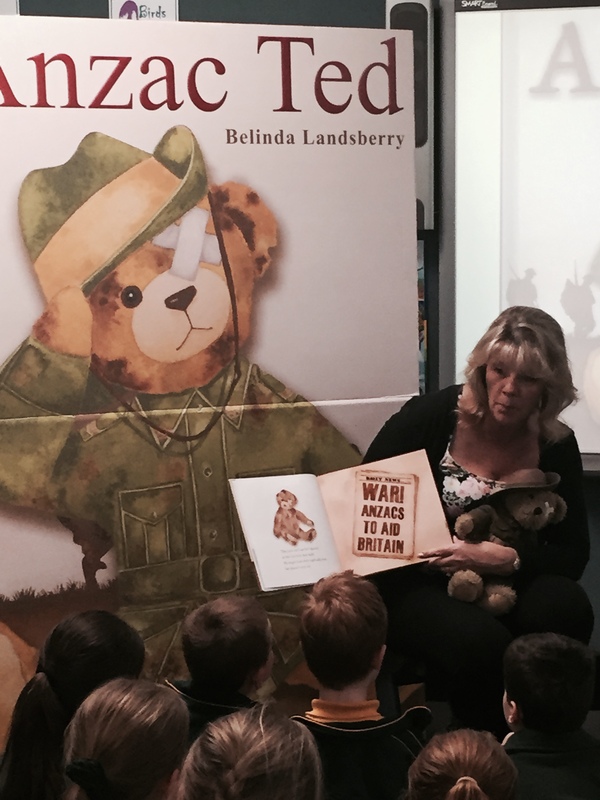 Being naturally curious they will ask questions – as I did as a child – and hopefully Anzac Ted will encourage engagement and discussion. And not just about war, but about its repercussions such as the returned soldier, the unsung hero, tolerance, acceptance and peace. While researching the illustrations for Anzac Ted, I spent a day at the Australian War Memorial where I wandered, unhurried, and lost myself in the halls of a defining piece of our history. It was eye-opening. And the more I saw, read and heard, the more I felt a deep sense of gratitude, respect and awe for these men and women who had gone before and given so much. I felt I owed it to them to learn a little about who they were and what they had done, and by remembering them, they would live on. 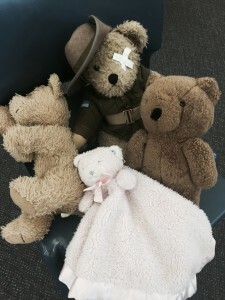 This entry was posted in Anzac Ted, Books and tagged ANZAC, Anzac Ted, First World War, Remembrance Day on 11 November, 2014 by belinda. 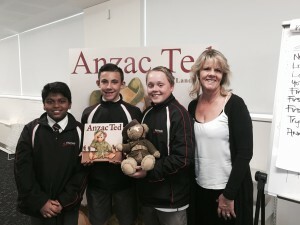 ‘Anzac Ted’ makes his debut! Very exciting news! 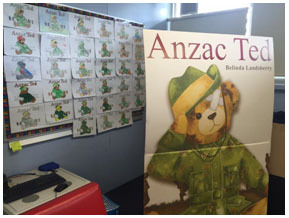 My first picture book Anzac Ted is now available for pre-order! ‘Anzac Ted’ is the heart-warming tale of a teddy bear who goes to war. This is a story about the unconditional love a young boy has for the battered old teddy bear passed down to him by his grandfather. A bear who – despite his ragged appearance – embodies the Anzac spirit. 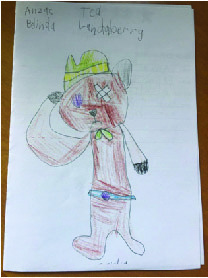 Through courage, loyalty and love, this brave little bear not only helps bring the Anzac soldiers safely home, he reminds us of what it is to be truly human. You can get in early and order your copy right here on Exisle Publishing’s website, and of course I’ll post again when it hits the shelves in November. 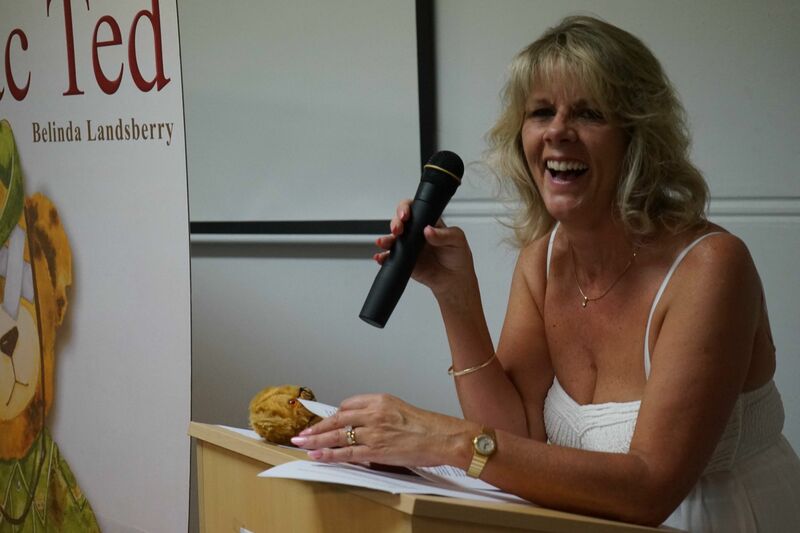 Also looking forward to my very first book launch – details to come soon! Oh, and happy Spring! How good is this sunshine? 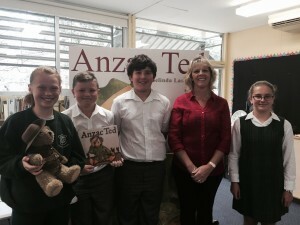 This entry was posted in Anzac Ted, Books and tagged Anzac Ted, book launch, Exisle Publishing on 14 September, 2014 by belinda.